Right now, 50 engineers and technicians at Fukushima are risking their lives to avoid a meltdown of crippled nuclear reactors at the plant. It’s already the worst nuclear accident since Chernobyl, and the fact that this happened in Japan, a nation that’s historically well-prepared for major natural disasters, made us wonder about our own nuclear plants in the U.S. How would they fare in the event of a quake or tsunami? And how do they train their operators to handle the wide range of emergencies that could pop up? To find out, I drove down to Plymouth, MA, to talk to the training staff at Pilgrim Nuclear Generating Station. 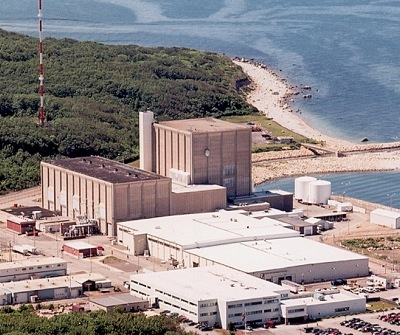 Pilgrim is only an hour south of our offices in Boston, and it’s one of 23 stations in the U.S. that use a similar reactor design as the Fukushimi Daiichi plant: a G.E. Boiling Water reactor with Mark I containment (the protective metal structure surrounding the core). This ominous connection to the crippled plant in Fukushima is not lost on residents of the Boston area. Local TV, radio, and print journalists have been covering the plant extensively over the last few weeks, and have raised a number of questions about the plant’s margin of safety. Pilgrim, after all, is nearly 40 years old, and is approaching the tail end of its operating permit. Unless the Nuclear Regulatory Commission (NRC) agrees to extend that permit until 2032, the plant will have to shut its doors next year. Despite the controversy, plant spokesman Dave Tarantino says it’s likely that the NRC will give them the green light to stay in operation. He cites the plant’s safety record, and new improvements like an extra backup generator installed half a mile from the coast. In the event of a power loss, he says that’ll keep the core cooling system running, avoiding a scenario like the one in Japan, where reactors may be heating out of control and approaching a partial meltdown. Tarantino also pointed to the extensive training that plant operators undergo, spending one week every two months running emergency drills in a life-size simulator of the plant’s control room. Since a tour of the plant itself needed a 48-hour security clearance, I met up with Tarantino and a few other Pilgrim employees inside that simulator, which is located just a few miles down the road from the reactor. 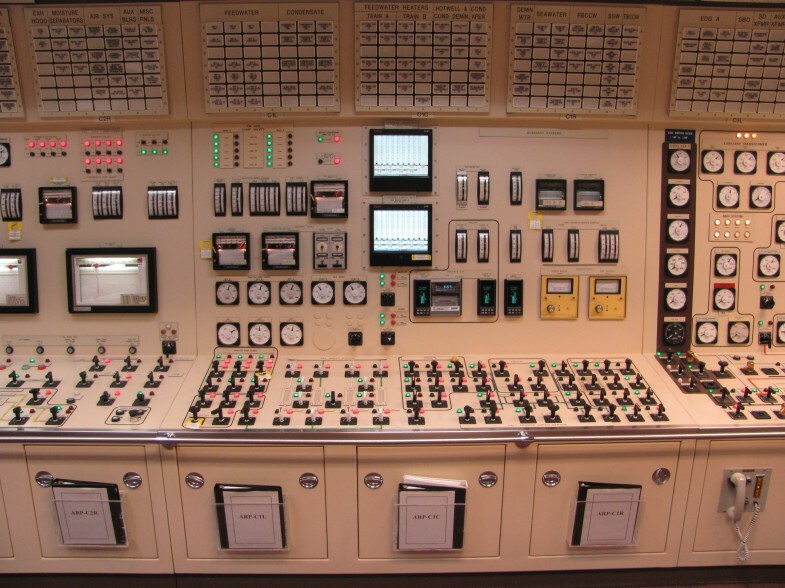 It’s an exact copy of the plant’s actual control room, right down to every knob, switch, dial, and audio signal. Even the trash cans and paint color match the real thing. Pilgrim senior operators Dave Noyes and Randy Haislet gave me a tour of the plant’s nuclear control room simulator. Photo courtesy WGBH. Walking inside the simulator is a bit overwhelming at first–the walls are densely packed with equipment, and I had no idea how the plant operators could keep track of it all. But Dave Noyes, the director of operations for the training center, says it’s just a matter of breaking things down. “It was overwhelming the first time I looked at it, too,” he says. “It really was. But one-by-one, you learn how the systems interrelate with each other.” Noyes has been working as a nuclear plant operator for more than 20 years, and knows every switch and dial by heart. He got his start at the plant after working as a naval engineer at the Norfolk Naval Shipyard in Virginia. Strangely enough, Noyes says that most plant operators and engineers come from a naval background of some sort. Two of the other operators I spoke to at Pilgrim, Randy Haislet and Al Muse, both cut their nuclear teeth in the U.S. Navy, tending reactors on nuclear-powered submarines and aircraft carriers. Pilgrim’s simulator facility is an exact copy of the plant’s actual control room, right down to every knob, switch, dial, and audio signal. Even the trash cans and paint color match the real thing. Photo courtesy WGBH. Like all the plant employees I spoke to, though, Reininghaus can’t imagine himself doing anything different. He says it’s part of who he is. Haislet and Dave Noyes both echoed that sentiment. They’re passionate about nuclear as a clean energy source, and are adamant about its safety. After giving me a demonstration of how they troubleshoot emergencies in the simulator, both seemed confident that plant operators could handle any emergency that came up. After all, they said, Plymouth has faced severe weather in the past. It’s gone through Nor’easters (New England’s famously harsh winter storms), it’s survived hurricanes, and it’s even lost power on a few occasions in the past. Each time, they were able to keep the reactor safe, and calmly work through the problems they were presented with. While it’s evident that its operators do train extensively for emergencies, I still left the plant wondering if there was a limit to human preparedness. Like Pilgrim, employees at the Fukushima plant also trained in a complex simulator, and that plant’s reactors were built to withstand both 25-foot tsunamis and an earthquake of magnitude 8.0. But the disaster that actually hit the coast of Japan was far beyond those limits. Pilgrim is also built for rare natural disasters. It can withstand a 7.0 earthquake and 16-foot storm surge. Granted, the northeast U.S. hasn’t seen events even close to that in centuries. But they still happen. The last major earthquake in New England was in 1755, and the effects of smaller ones–like a magnitude 5.0 quake that hit Quebec–have rattled New England as recently as 2010. The staff at Pilgrim and other nuclear plants may be well-trained, but the events at the Fukushima Daiichi plant show that nature can sometimes overwhelm even the most careful preparation. And as U.S. policymakers watch Japan grapple with its nuclear disaster, it’s unclear what the fate of Pilgrim and other similar U.S. plants will be. 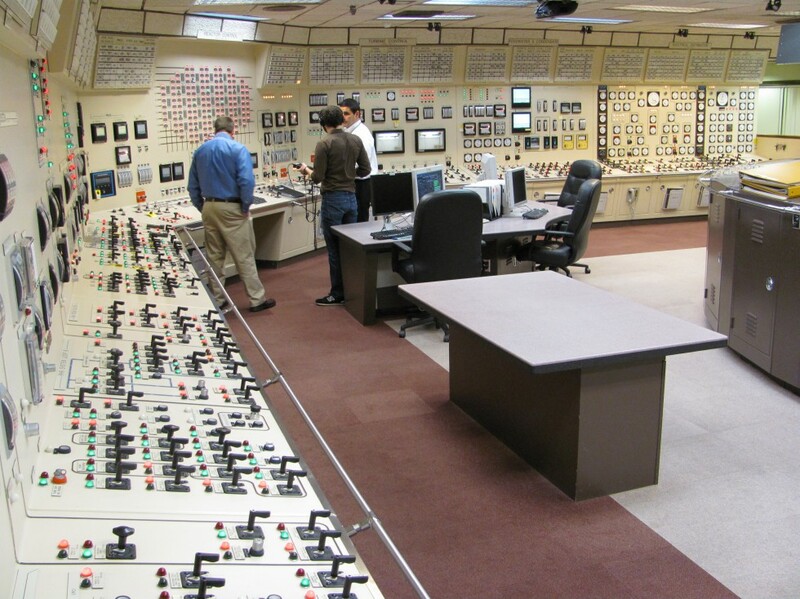 Editor’s note: You can take a virtual tour of Pilgrim’s nuclear control room simulator in this interactive Gigapan panorama, or listen to our audio story, “Training for a Nuclear Crisis,” on the NOVA website. Originally written for Inside NOVA, the NOVA staff blog. Posted on April 5, 2011.